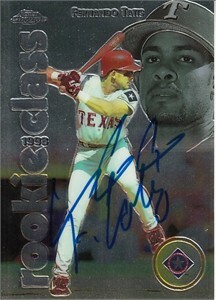 1998 Topps Chrome Rookie Class card autographed in blue Sharpie by former Texas Rangers third baseman Fernando Tatis. Obtained in person, with certificate of authenticity from AutographsForSale.com. ONLY ONE AVAILABLE FOR SALE.